Abroad, if only I can, I inspect the assortment of wines. Not primarily in the wine shops, but rather in the supermarkets which better show how the people passes time (Petőfi). 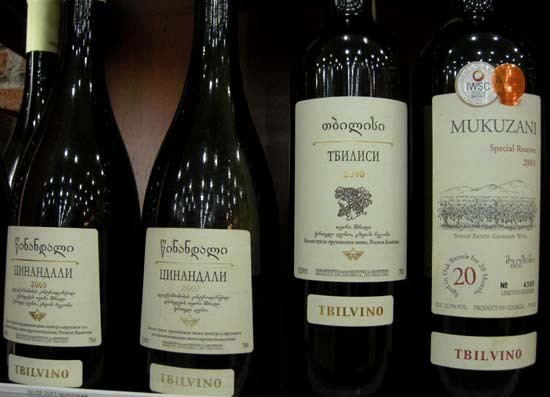 In Azerbaijan, as expected, mainly the Georgian wines dominate the shelves: Khvanchkara, Kindzmarauli, Pirosmani, the classical varieties and reliable quality known from the times of the empire, although I find their taste not particularly complex. 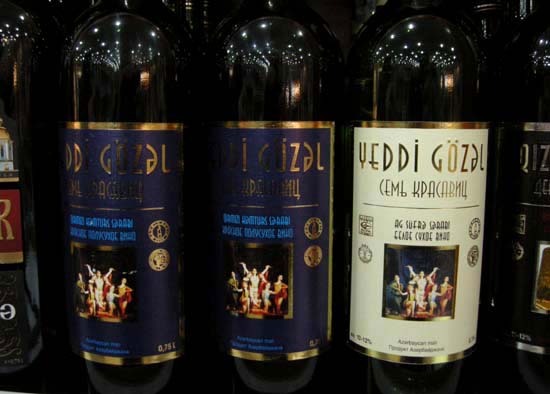 Among the wines of Azerbaijan the Yeddi Gözəl, that is the Seven Beauties is considered the best, although on the basis of its label you would not vote much confidence to it, neither to the one called Qız Qalası, that is Maiden’s Tower after one of Baku’s main architectural monuments, whose label is just hanging on the right in the picture below. A special group among the Azerbaijani wines are the ones named after the legendary Turkic heroes: Koroğlu, hero of the first Turkic epic poem, Attila, king of the Huns and Sheikh Ismail, unifier and Shah of Iran and founder of the Safavid dynasty, who was also one of the most significant early Azerbaijani poets. 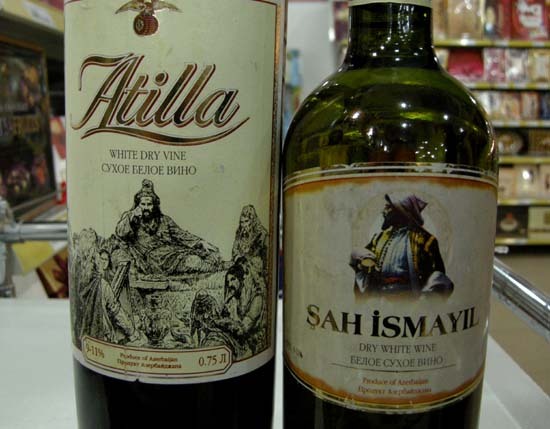 Since these wines are to be found on the lowest shelf, there are concerns that the heroes do not refer to the result of their consumption but to the courage necessary to it. However, as my host is Muslim, therefore I have not yet tasted any local wine. 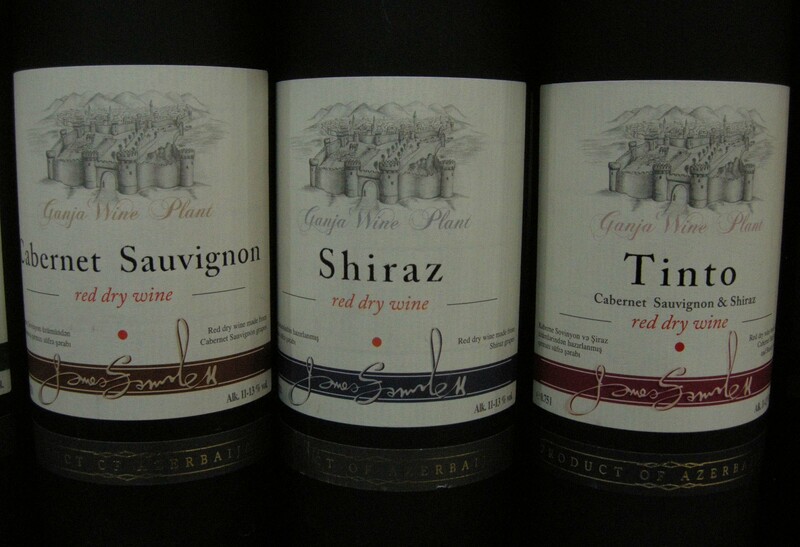 I will take to Wang Wei an elegant Shiraz from Ganja. Since the wineyards praised by Omar Khayyam have been wiped out in the Iranian Shiraz, this is the nearest region where a wine is produced under that name. You had a decent Mukuzani right there! It may not be complex, but this ain't Cali anyway. 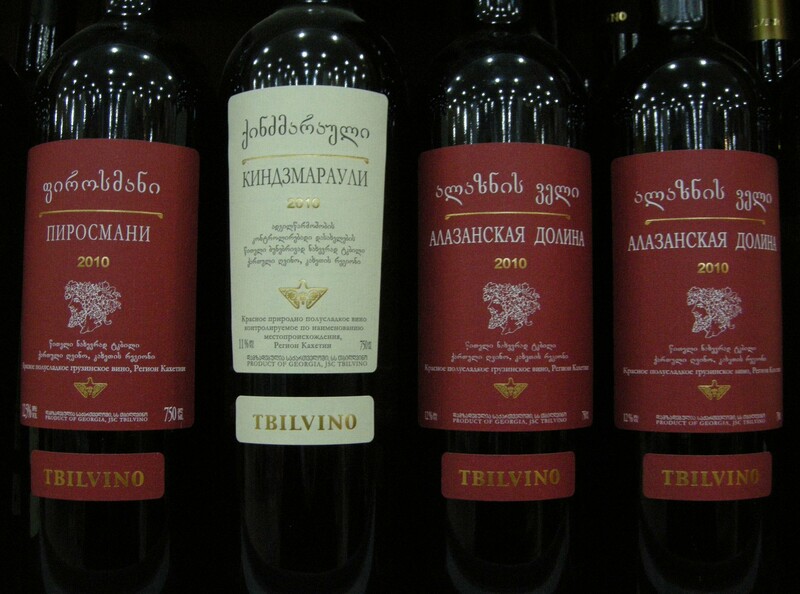 All the same, I'd be first in line to try an Azeri Cabernet. No, no, my deepest hat tip to all Georgian wines. I've tasted much of them and really appreciate them. I only wanted to say that I prefer the rich and sophisticated taste of, let us say, the good Catalan wines. 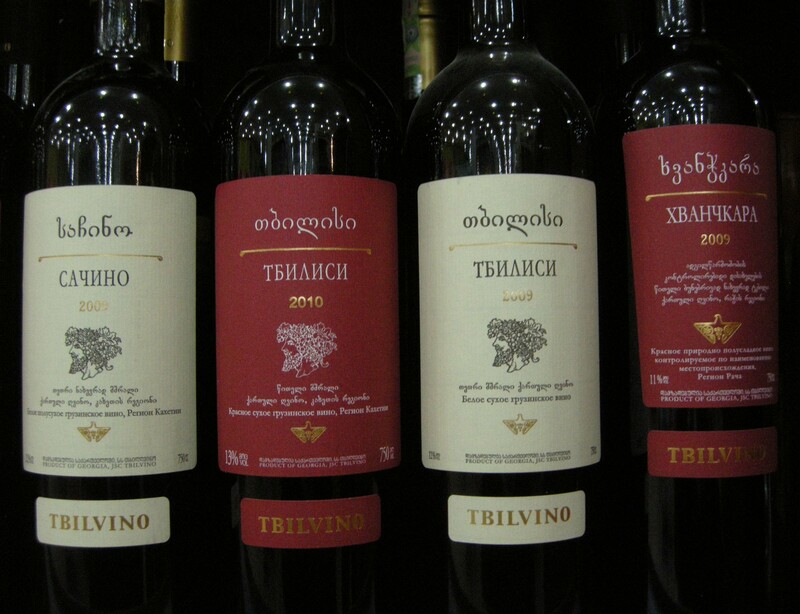 Well I won't speak for the sweets/semi-sweets (I'm not a fan) but - you're right - Georgian dry wines are incomplex. That's their charm! But a Saperavi will never taste like a Madiran, or a Californian Pinot Noir, or your Catalans, or whatever. I just accept each on its own terms. it is interesting how the typography of the labels leads directly to a judgment of the wine. The hero wines are alarmingly cheap-looking, and I would not have attempted the Yeddi Gözel. Normally I don't care for regional wines that are labeled by varietal - a Cabernet Sauvignon from France is unlikely to be distinguished, for example. However I shall thirst from afar for the Ganja Shiraz.. I find wikipedia has a surprisingly comprehensive article on Azerbaijani wines. 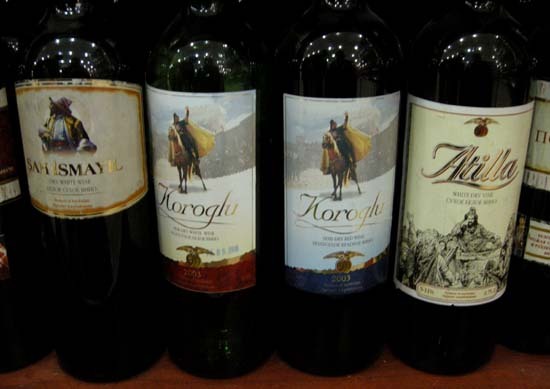 I tasted a lot of Azeri wines during a stint @ Sumgait in the 80s, that's of course before Gorbachev ordered the vineyards plowed over. They tasted like watered down versions of the more familiar Georgians, but being cheap as they were, who'd object. The Muslim locals very much frowned upon grape wine drinking though. Vodka was the only socially acceptable way. BTW - OT but would you consider weighing in on my musings about Shakh Abbas remixed as Stalin ;) ? Thanks for your posts about Azerbaijan, Studiolum. One small note though - Koroghlu is a hero of medieval (XVII century) Turkic epic legend. The first written Turkic epic poem is Dede Gorgud. Thank you all and sorry for replying late – I’m having difficulties in accessing internet. Yes, to my experience the style of labels and the quality of wine are more or less correlated to each other – of course there are exceptions. I have experienced the same with CDs, too, with one notable exception: in China several CDs of classical Chinese music with an extremely elegant and refined cover design hide a mediocre music. Москва: er… I would be happy to weigh in as I also find some similarities between the two heroes, at least in ruthlessness, but where? As I have now difficult access to internet, perhaps I have lost something in the last days? Yes, I have also seen that sweets and semi-sweets are to a great extent counterfeited and in many cases even toxic not only in the former empire, but also in the all former Eastern bloc. I do avoid them by all means, and I warn every unsuspecting reader to do the same!